Hi there 🙂 I’m so excited to actually be caught up….sorta…..on my DT projects and get to have some fun with other artists’ work 🙂 This lovely image is from an artist that I recently discovered (through my Creative Fingers DT), named Christine Karron. 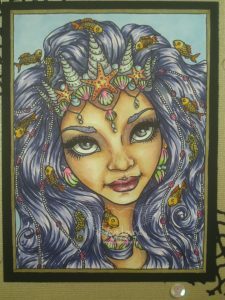 Her gorgeous mermaids and fairies really captivated me. This mermaid is available in both grayscale and lineart versions, as well as in packs. I opted for the lineart (as usual), found HERE. I colored her with my Copics…..using almost every color I had, LOL. I decided to keep the color scheme of the card simple, because of the colorfulness(?) of the image, and went with black and gold. 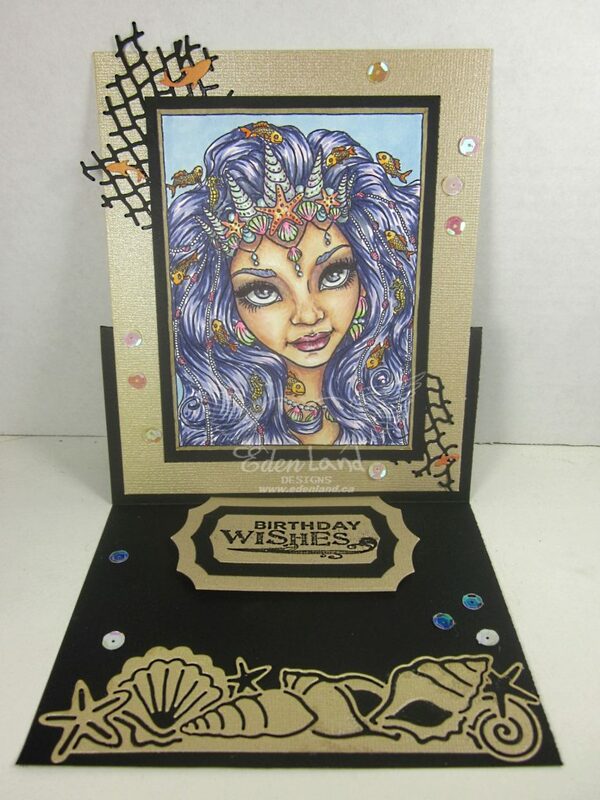 After making an easel card base up, and matting the image, and stamped/embossed sentiment, I die cut some fish net and a sea shell border to dress the card up. For some final touches, I also added some tiny fish die cuts and a scattering of iridescent sequins 🙂 I can hardly wait until I free up some more time to play with images from this fabulous artist!!! Fabulous card! Gorgeous image and colouring! Thank you for joining the Scrapping4fun. This is gorgeous Thank you for sharing with us over here today at the Classic Open Design Team Challenge and best of luck with your entry. 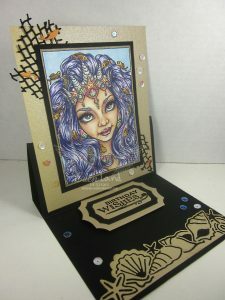 Such a gorgeous card and coloured so beautifully. Thank you for sharing with us at Polkadoodles Crafting https://polkadoodle.blogspot.com/, good luck and I hope you will join us again. Your mermaid princess is beautiful. Thank you for joining us at Scrapping4fun challenges. Cute! Thanks for joining us at Let’s Craft and Create. This is so gorgeous, such beautiful colouring, love it! Thank you for sharing your beautiful make with us over at Polkadoodles Crafting Challenge and hope you will join us again. Thank you for joining us at Scrapping4fun. GORGEOUS colouring! I also love the gold/black background, too. Thanks for joining us at Let’s Craft and Create!